Roddy Haynes and Grant Lange of Associated Bank in Neenah are teaming up with Taft Elementary School to teach 42 third graders the importance of saving money at a young age. 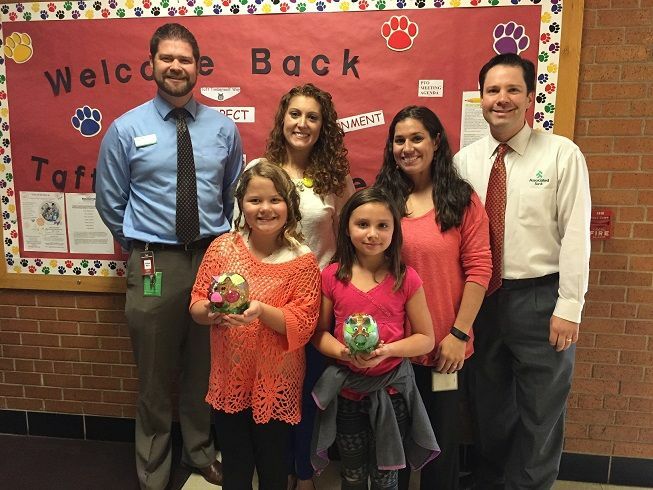 Haynes, vice president & market manager, and Lange, assistant branch manager, began visiting the school the week of October 5 to teach a Junior Achievement curriculum. They taught the children about managing money and how to better understand the importance and role that money plays in their lives and the local community. As a part of the class, the third graders had the opportunity to decorate their own piggy bank donated by Associated. This week the board of judges will choose their top five piggy banks. Participating in the judging will be the City of Neenah Mayor, Dean Kaufert, Taft Elementary School principal, Dr. Lucille Hrib, as well as other faculty members. The top five piggy banks chosen will be on display at the Associated Bank branch in Neenah at 100 W. Wisconsin Ave from Saturday, October 17 to Friday, October 23. Parents, teachers, and customers are encouraged to vote on their favorite piggy bank. The first place winner will receive a savings account funded with $30 from Associated Bank, and second place winner will receive a savings account funded with $20. Associated offers banking accounts supporters of the Neenah Joint School District (NJSD) called Rockets Banking. The bank will make a donation to NJSD for every new Rockets Banking account, including $50 for new checking accounts, $25 for new money market accounts, $10 for new savings accounts, and $5 for new certificates of deposit. They will also make quarterly donations based on total deposit balances of all Rockets Banking members.